u-blox has announced that its SARA-N2 NB-IoT modules have entered the initial production stage. In addition to being certified for use in Europe, Asia and Australia, the module has received ATEX certification for deployment in hazardous environments, expanding the scope of the Internet of Things (IoT) to new industrial applications. NB-IoT is establishing itself as the technology of choice for many industrial IoT applications including metering and sensor applications. This is driven in part by the technology's low power requirements, which let end devices run for years - sometimes more than a decade - on a single battery, minimizing the need for maintenance. Additionally, excellent indoor and underground signal penetration and wide-reaching coverage enable IoT applications in otherwise challenging locations such as in cellars, deep underground, or in remote areas. The SARA-N211 product variant, which targets the European market with support of Bands 8 and 20, is the first NB-IoT module to receive ATEX-certification for use in hazardous and potentially explosive environments often encountered in the oil and gas industries, in chemical plants and in mining applications, further extending the reach of NB-IoT. ATEX pre-certification saves end-device makers time and resources by assuring compliance, while simultaneously speeding up testing and simplifying end device certification. Importantly, it minimizes the risk of last-minute changes to the module to meet ATEX demands. 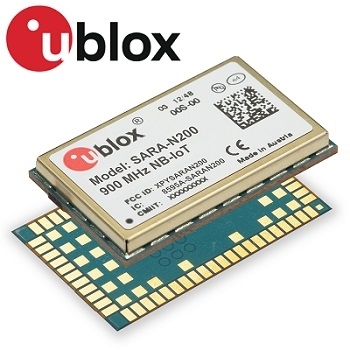 The u-blox SARA-N2 series modules are available now. Click here to learn more about these modules.